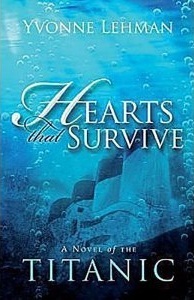 Hearts that Survive – A Novel of the Titanic is Yvonne Lehman’s 50th novel. She is a best-selling, award winning author who founded and directed the Blue Ridge Mountains Christian Writers Conference for 25 years and now directs the Blue Ridge “Autumn in the Mountains” Novelist Retreat held annually in October (www.lifeway.com/novelretreat). She lives in Black Mountain, amid the panoramic views of the Blue Ridge. She mentors students for the Christian Writers Guild. She earned her Master’s Degree in English at Western Carolina University and has taught English and Creative Writing on the college level. You can visit Yvonne Lehman’s website at www.yvonnelehman.com. Leave me a comment with your name and email for a chance to win a copy of this great book!!! Will be chosen by Random.org Open to USA and Canada! Ends April 28th at midnight! WOuld love this book! Thanks. Sounds very good! Thanks for the chance to win! Oh, wow, the best giveaway, I would love to win and read this book. I love reading about anything that deals with the Titanic, fiction or non-fiction. Thanks for the chance to win. What another great review, Melanie. Thank you for sharing, and for the awesome opportunity to win this book! I would love to win this book. I feel like I was on the Titanic in another lifetime. I LOVE stories about the Titanic - so fascinating! Thanks for the chance! I'd like to read this novel. Thanks.